Members of Mind of Adam at the event at the Church Hall on 23rd June 2012. See note below. Photo copyright of Chris Lambley. A Brilliant night, we sang along with every single one of the hits played by “Mind of Adam”. Showing our age, but “They don’t write songs like that anymore”. Looking forward to another gig with Mind of Adam. Members of the band Mind of Adam with a cheque for £644.88 which was presented to Rev Helen Guest at an evening of 60s and 70s music at the Church Hall, Sheepcote Road on Saturday night the 23rd June 2012. 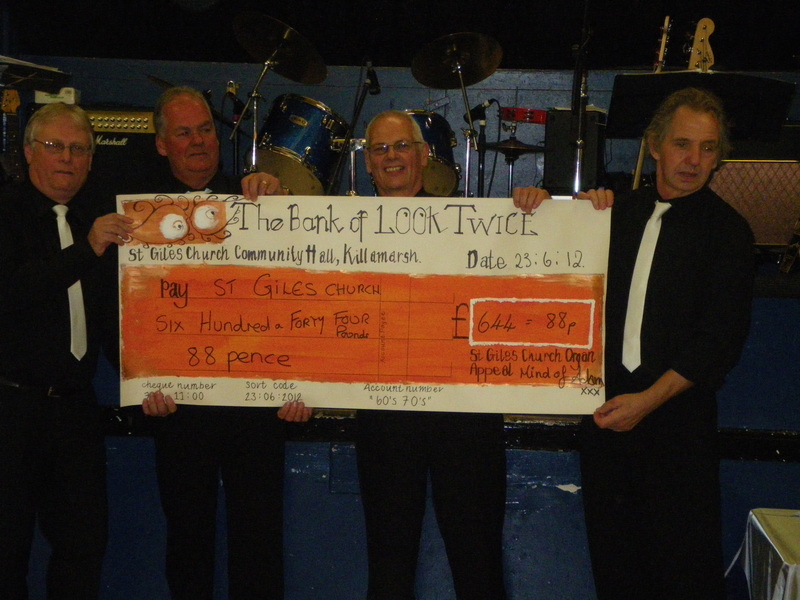 The event was organised by Marilyn Delaney of the Look Twice charity shop to raise money for the St Giles Church organ appeal and the amount raised was made up of money raised on the evening and a donation from Look Twice. It was a very enjoyable evening with happy memories of Friday nights at the Church Hall in the 1960s!